A great product and an ever better review. Look forward to trying em out. One thing I never leave behind is a Tilley Hat. I have a large brim sun hat and a winter tec-wool. I almost never leave the house without it and on a hike or outdoor adventure It’s always with me! I have had a couple of hats, but never really one that I was that attached to. I did just get a new black hat I might start getting attached to. I’m in ! thanks for the great review! One piece of gear that I love that has to be the cheapest thing I own or carry is a tiny battery operated fan from the dollar store. Can’t say I came up with it myself. I was at a shelter on the AT when a large group came up and watched as an older guy started to build a fire to cook. He built his little tee pee of wood, struck a flint and then whipped out a little fan (the type with just a handle and a fan with a plastic blade) and had a fire going in a second. While myself and others watched thinking why had we not thought of that to get a fire going. Cheap and good. 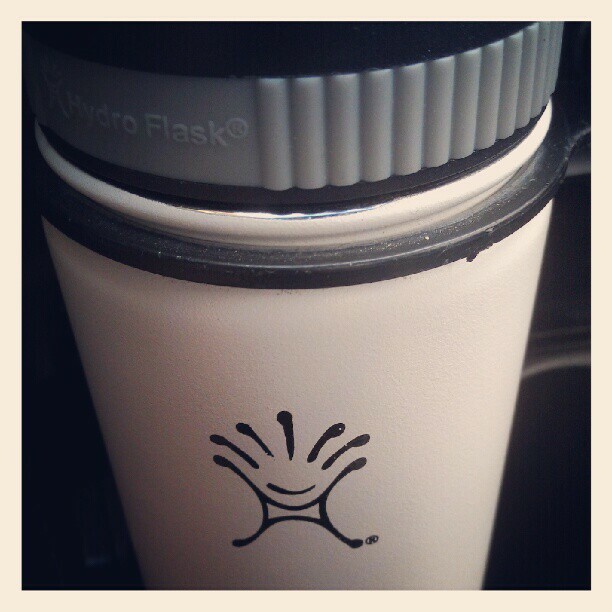 The hydroflask with my areopress make morning great. At work or camping or hiking or before sons hockey. Thanks for the review. This will be the perfect gift for my boss for Christmas. She is a water snob and will only drink cold water and is grumpy without, so will be also be a gift to me to not live with a grumpy boss. ha ha. not sure if less expensive somewhere else but this site had free shipping on any order. but will check out Overland Gourmet more often – yummy site! Free shipping and some products discounted. Interesting source. Nice Review! It occurred to me the other day walking past my local outdoors store that every item I was wearing was something I first learned about through one of the hiker-oriented blogs I follow, and from my boots to my baselayer, none of it was offered in that store. Don’t know if that store carries Hydroflask, but I intend to add it to my stuff based on your review. HA! Thanks, Jeff…you will not be disappointed! A piece of gear I absolutely love is my new Big Agnes double wide sleeping bag. It’s the bomb. I usually freeze at night when summer camping and it kept me warm while sleeping in 20 degrees. Love it! Thanks for the opportunity and great review! Is that double-wide as in two-person bag? What kind of sleeping pad do you use under a bag like that? I too have a love affair with my hydroflasks!! I discovered them this summer in the Memphis heat and had a similar experience upon the first time I used it…went above and beyond my expectations and continues to perform. I wanted something that did not sweat and kept water cool…I could have never imagined it would keep it COLD for that long and that’s when I became obsessed. I have 4…one wide mouth for work with flip lid, one wide mouth for play with screw cap and a 21 oz standard and 18 oz narrow both with sport caps that I take to sport events and my boot camp class! I tell everyone I know (and they think I am crazy til they see for themselves) and they make the perfect gift!! It just seems rare these days with all the hyped up products that something actually works as advertised and HYDROFLASK gets the job done and that’s why I have to spread the word…well worth the few extra bucks and toss all others! That’s awesome! So good to hear of someone else discovering these awesome bottles! I never thought I would get so excited about a bottle, but it works and it’s awesome. Thanks for sharing your experience with them, Leah!